Invisalign straightens your teeth without wires and brackets, using a series of clear, customized, removable appliances called aligners. 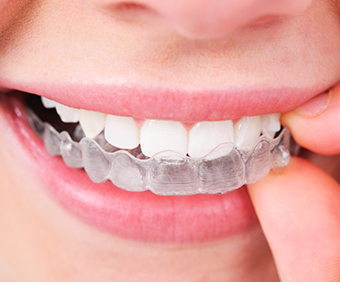 These aligner trays are made of smooth, comfortable, clear plastic that you wear over your teeth. 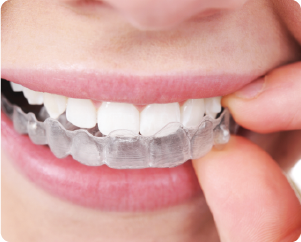 Wearing the aligners will gradually and gently shift your teeth into place. There are no metal brackets to attach and no wires to tighten. The aligners are virtually undetectable, which means hardly anyone will know that you’re straightening your teeth. 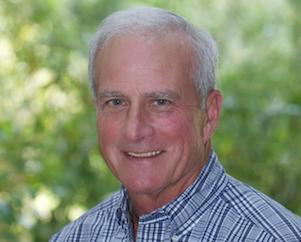 Having straight teeth is important not only for children, but for adults as well. As we grow older, our teeth tend to grow inward, creating crowding - a common problem for many teens and adults. As a result, it may be difficult to keep teeth clean and healthy. Straightening your teeth with the Invisalign system can treat the crowding and thereby help you maintain your dental health. 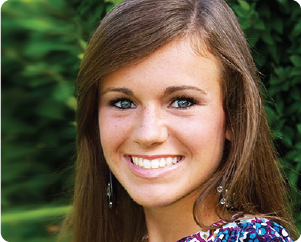 Not all teens and adults are candidates for the Invisalign aligner system. To ensure the best possible results, please contact our office to schedule a complimentary consultation with Dr. McFarland to see if the Invisalign system is right for you. There are other options out there for straightening your teeth, but none offers the level of comfort, convenience and confidence that you'll find with Invisalign. No matter what stage you're at in life, you'll appreciate how our cutting-edge approach to treatment has minimal interference in how you live, but has a significant positive impact on how you look and feel about yourself.